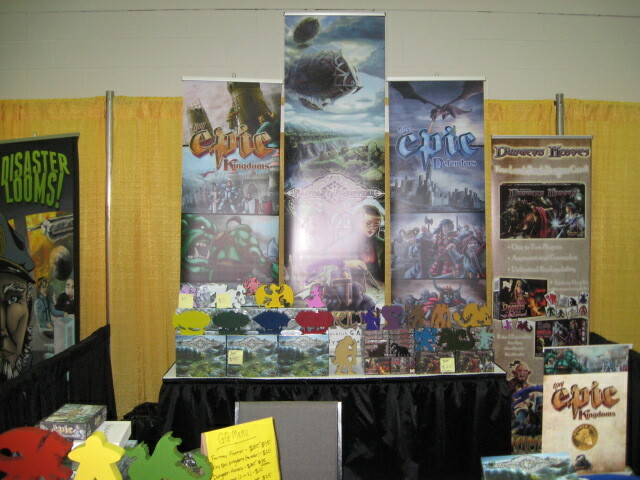 I spent June 10 to June 16 in Columbus, Ohio for this year’s Origins convention. 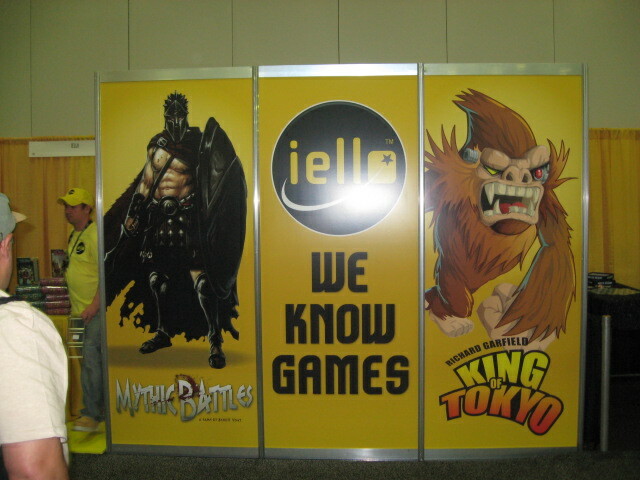 It was a good convention for the gamers and merchants–nothing memorable for me. There really wasn’t much in the way of hall costumes. 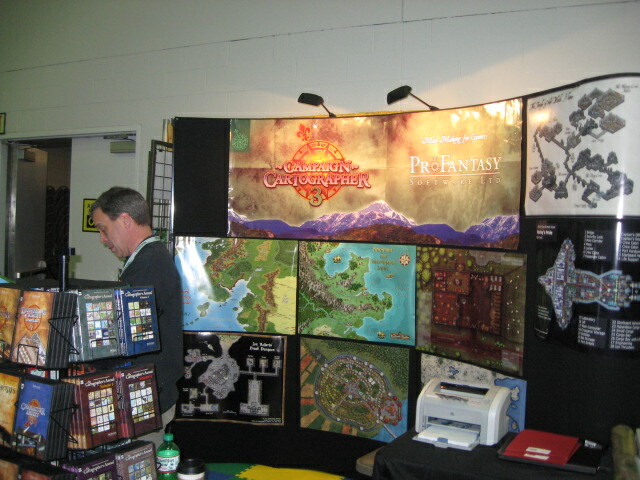 So, this year I’m devoting the blog record to the merchants and the signs that marked their booths. 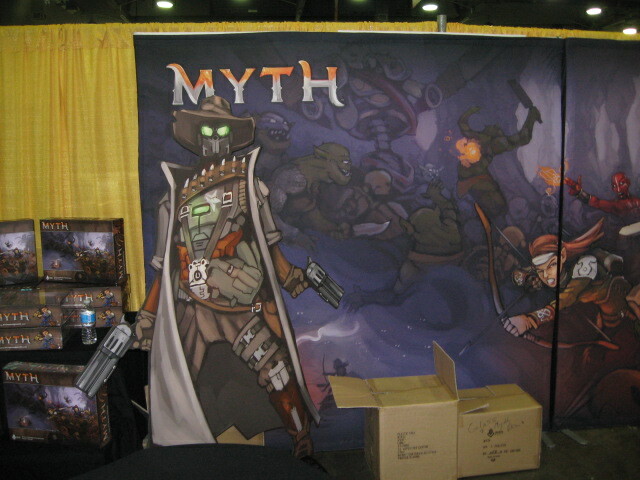 I’m just gonna show some of the best booth banners and maybe a few other things that justified a photo. 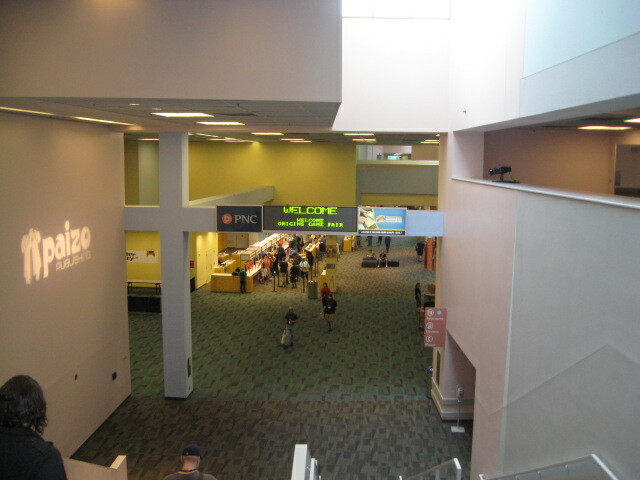 Looking at the main concourse lobby on Wednesday morning before the crowds arrived. 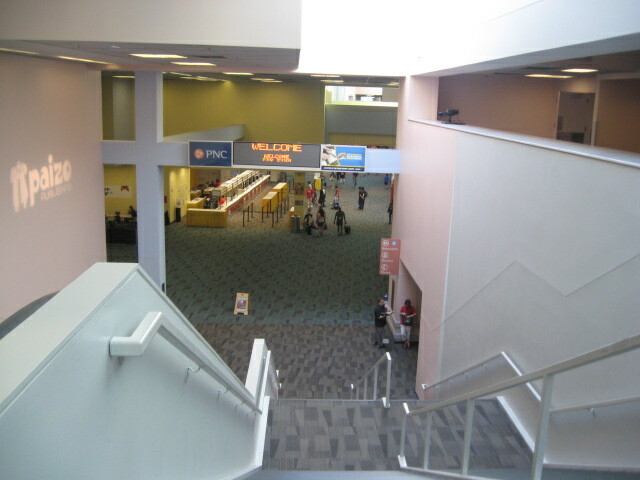 A distinctive feature of the convention center is this gigantic staircase that is seven aisles wide–three escalators in the center and two wide stairways on either side. When I felt strong, I climbed the stairs, averaging about 5 flights of stairs per day. 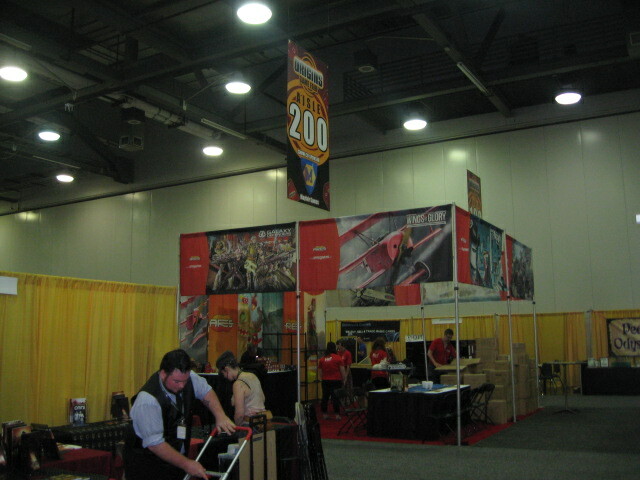 The Exhibitor’s Hall before anyone gets set up. HackMaster was just across the aisle from Flying Buffalo. 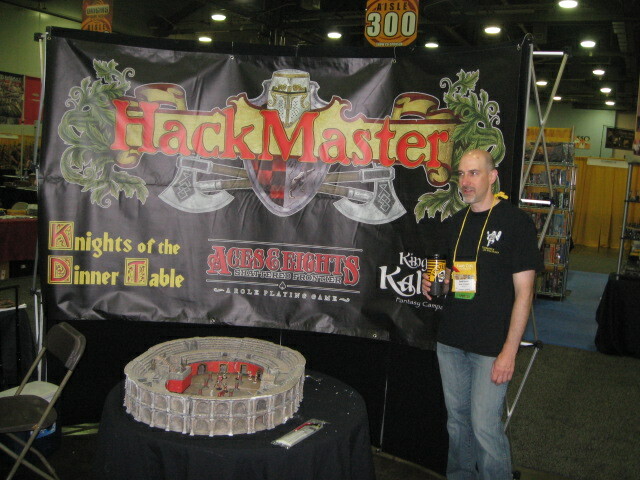 Dave Kenzer is standing by the HackMaster Banner. I just wish Tunnels & Trolls had a banner like this. 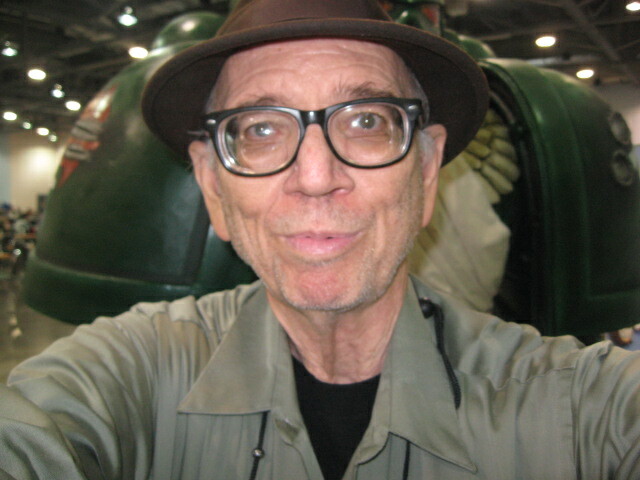 Jolly Blackburn, creator/artist/writer of the Knights of the Dinner Table comic book poses heroically. 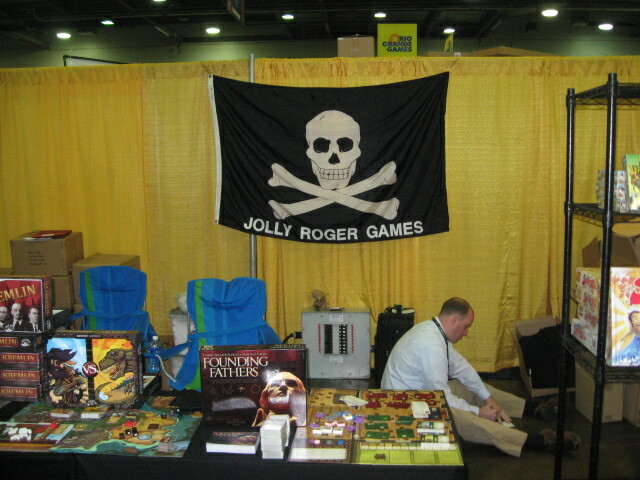 My friend, Jolly, personifies all that is best about gamers at Origins. This is the single nicest guy in gaming, even nicer than me, and I’m as easygoing and friendly as you could ever wish. Jolly is better. Here begins the great banners of Origins. I’m not going to comment on most of the banners. I told these guys I expected some tribute because I’m the Trollgod, but it didn’t happen. They even stole my acronym, T&T. Heh, I’m using this cartoon as my background on Facebook right now. Fantasy cartography is getting pretty great, but not for Mac owners. Ya think something might be epic around here? 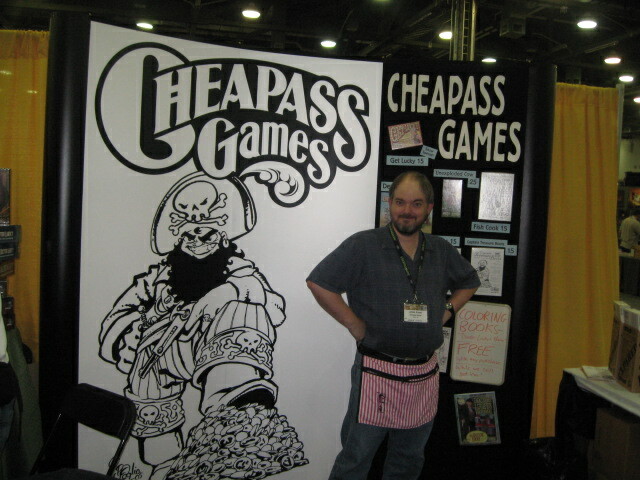 James Ernest is still the mastermind behind Cheapass Games. I had a good talk with him at a later time. 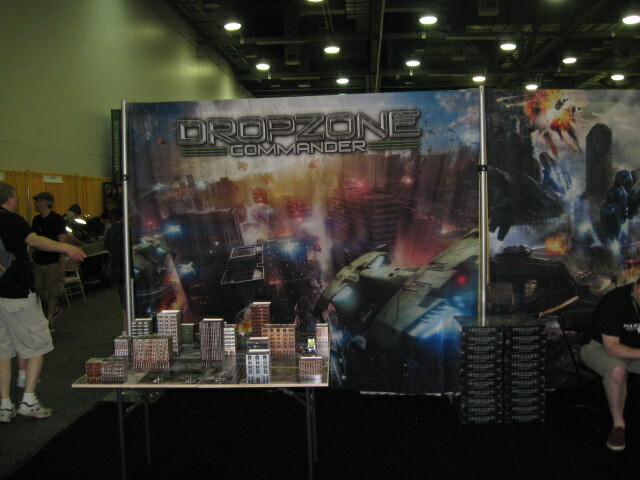 I demoed this game. 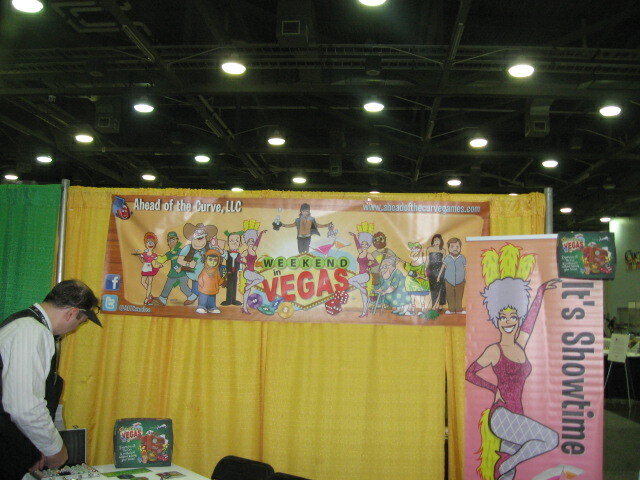 It was kind of fun, like a g-rated version of Las Vegas. This is a beautiful educational game that looks like a lot of fun to play. 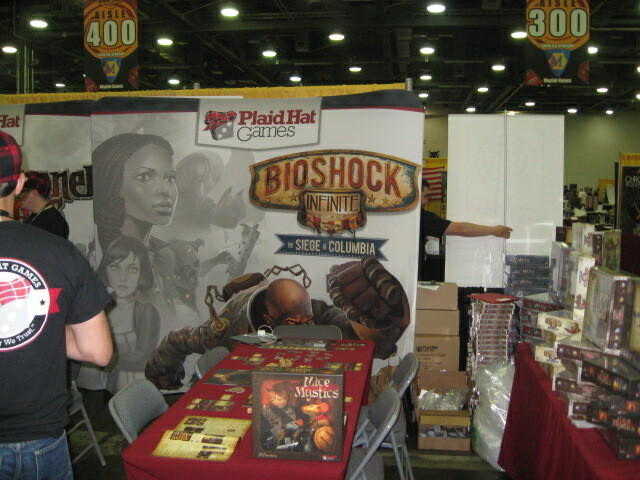 The designer and his family will be thousands of dollars in the red, and unlikely to appear again at next year’s Origins. Sad, but true. 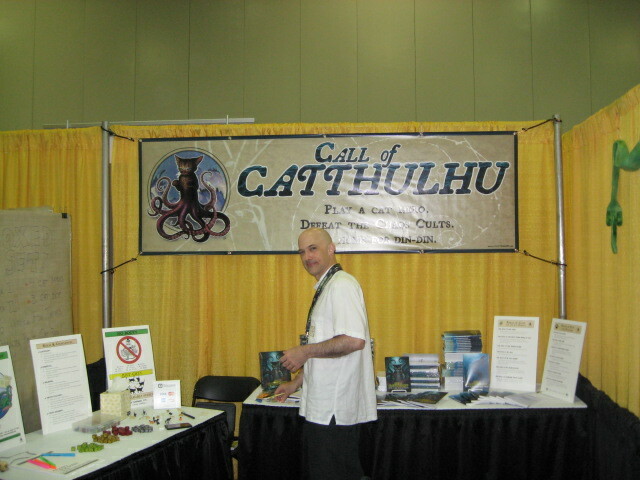 That is still the fate of most self-published books and games. 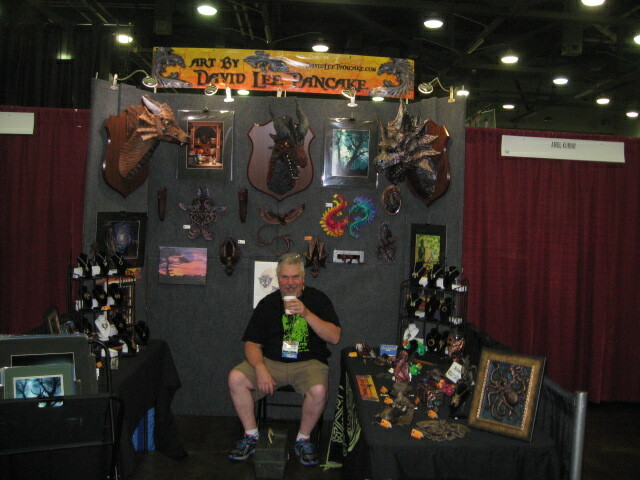 This guy is a talented artist. 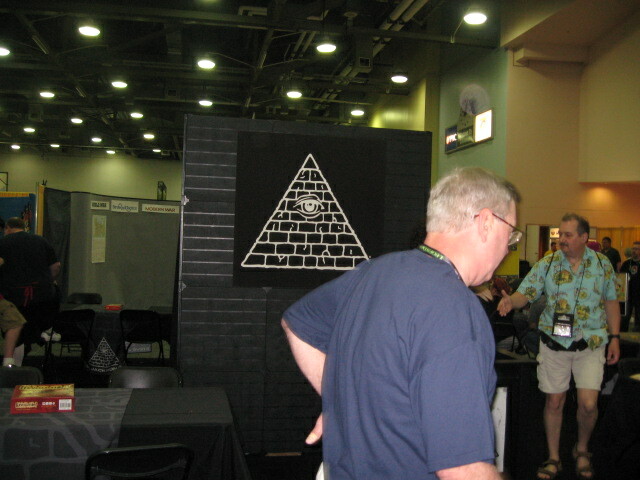 A lot of artists come to Origins. I don’t know why. 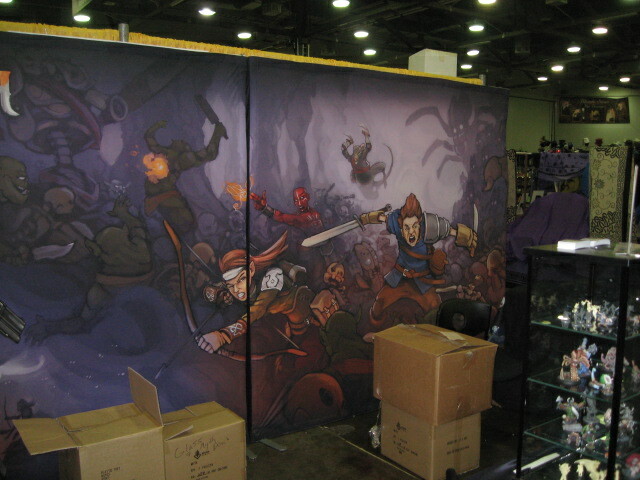 Gamers are mostly not interested in buying or commissioning art. 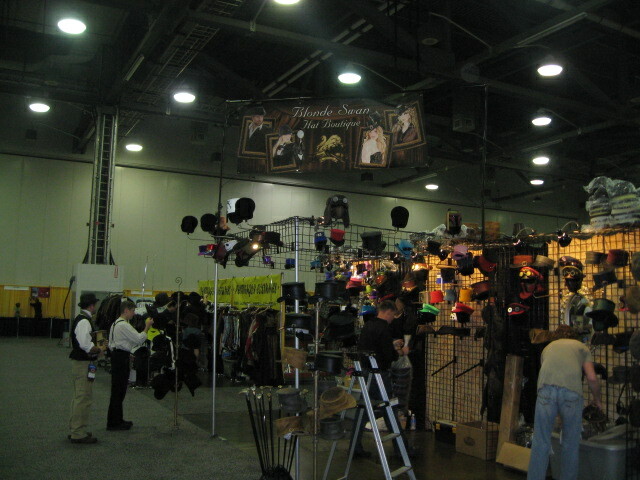 There was some great steampunk costumery stuff. You had to be rich to afford it. $80 vests. $500 coats. 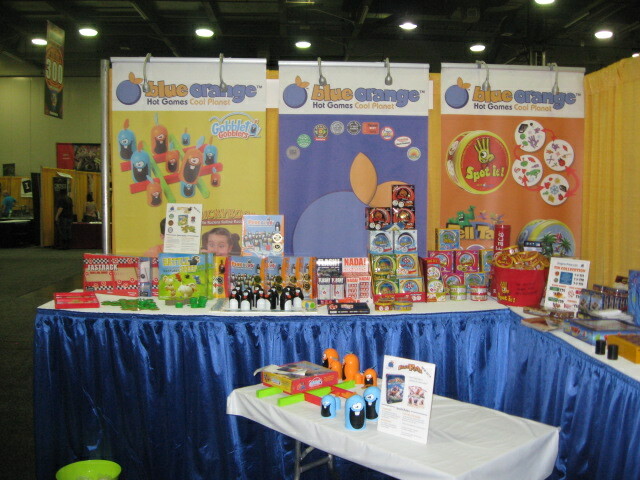 Technically, this is more of a toy company than a game company, but you could certainly use these toys in games. 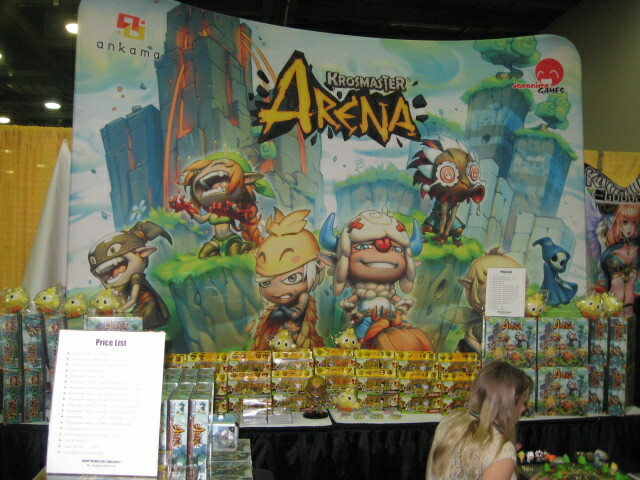 Henry Lopez (seated, white hair) is a man who produces quality games. His Witch Hunter 2nd edition rpg is one of the few things I brought back with me from Origins. I’ve played King of Tokyo. 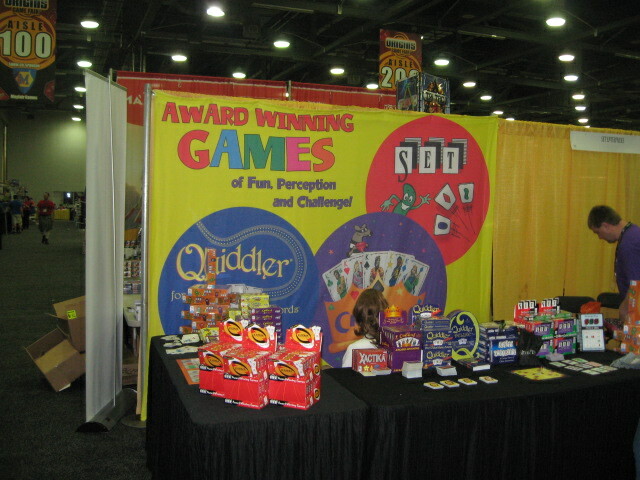 It plays fast and is good fun. Brilliant game! There were a lot of zombies at the show. 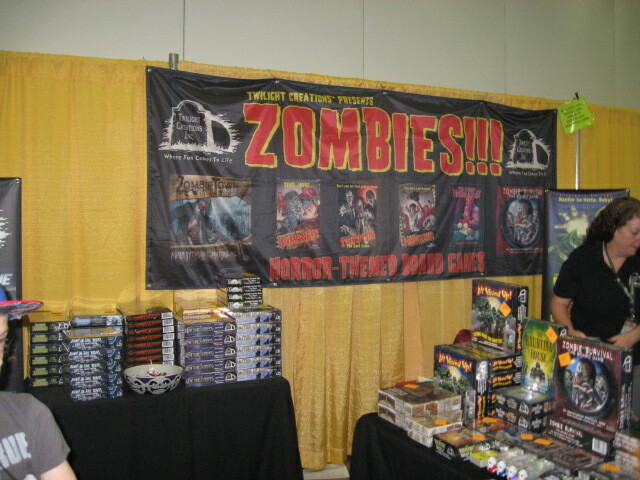 Zombie games remain popular. 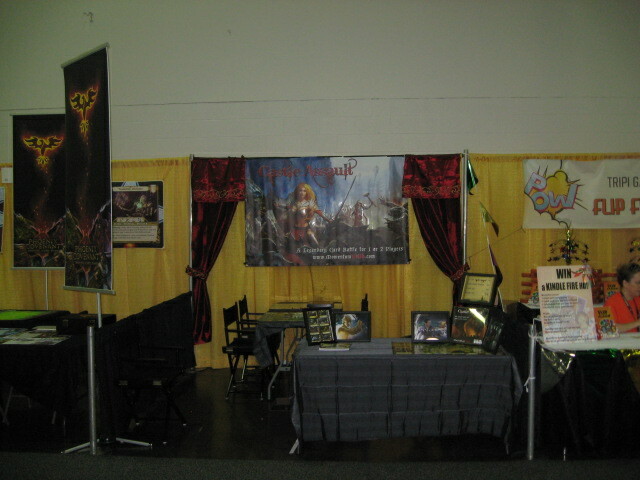 Steve Jackson games was there, of course, doing their highly irritating “Exact Change” song and dance whenever anyone paid with cash in the exact amount asked for. 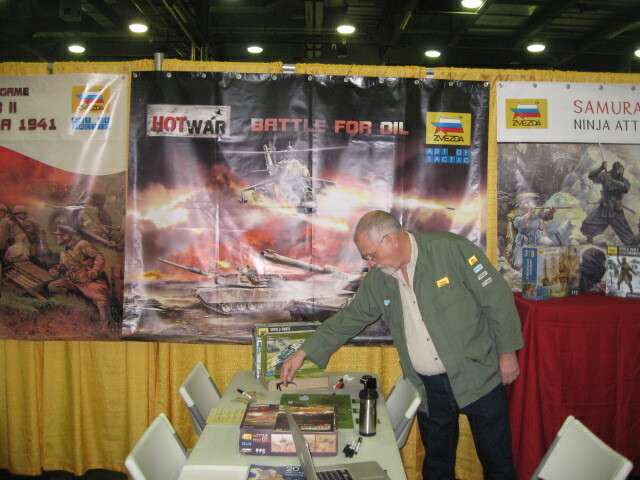 Will Neibling Sr. is a Hall of Fame game designer with a deep interest in World War II and military simulation. 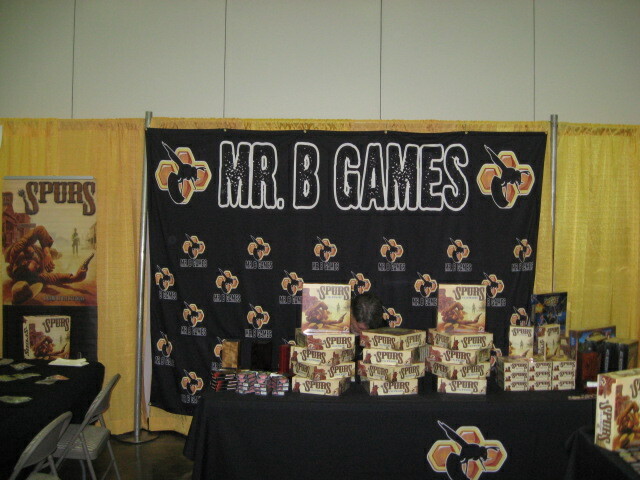 He still runs his own game company. 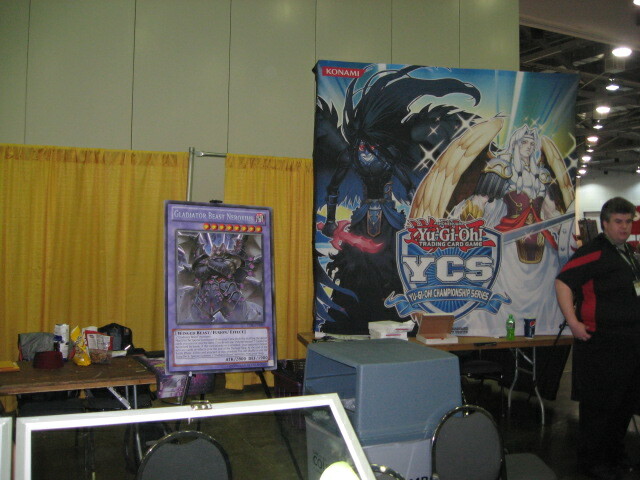 It was a big panel and took 2 photos to show it. 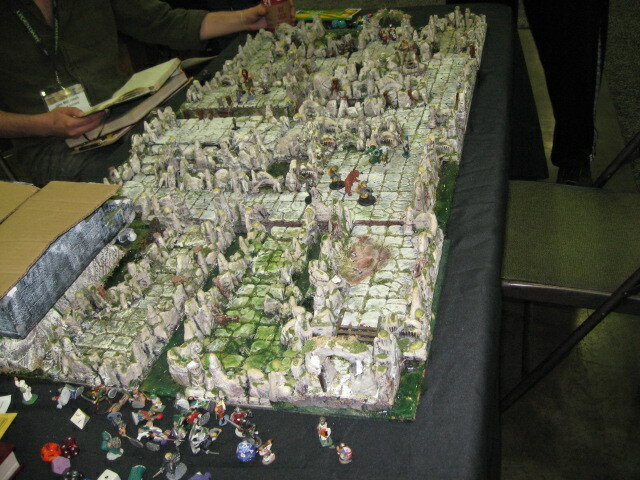 3D open dungeon on display at the Kenzer booth. 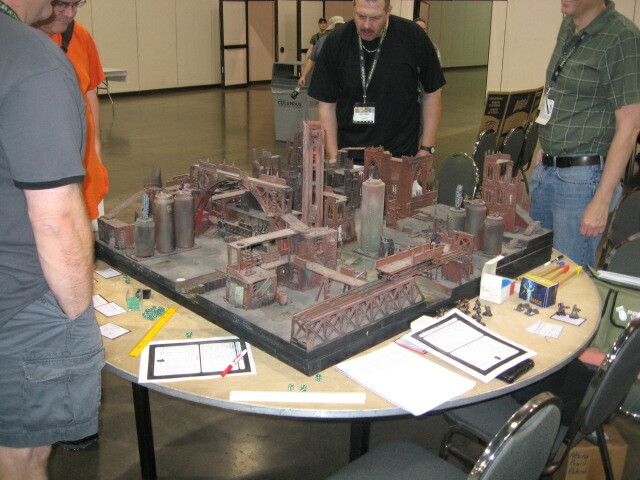 The pieces are modular, and can be built into any pattern you wish. 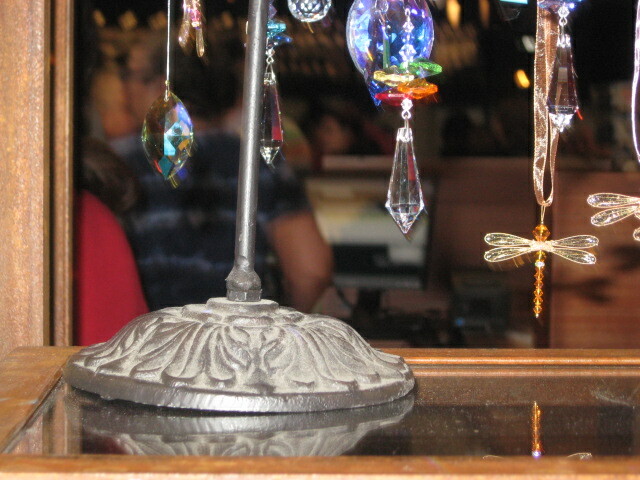 Great for miniatures, and so pretty. 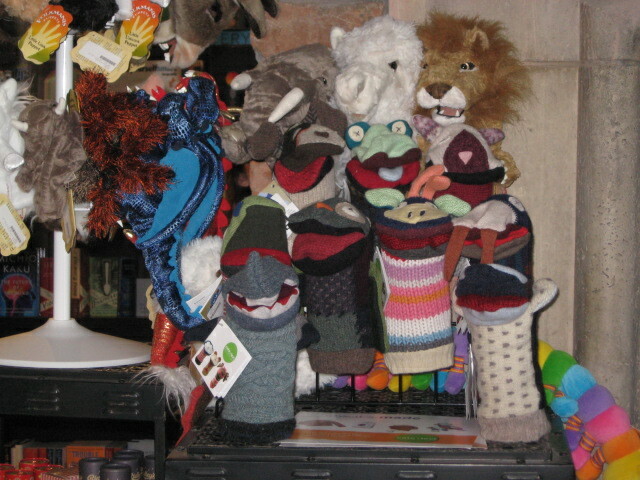 Where do they get those marvelous toys? 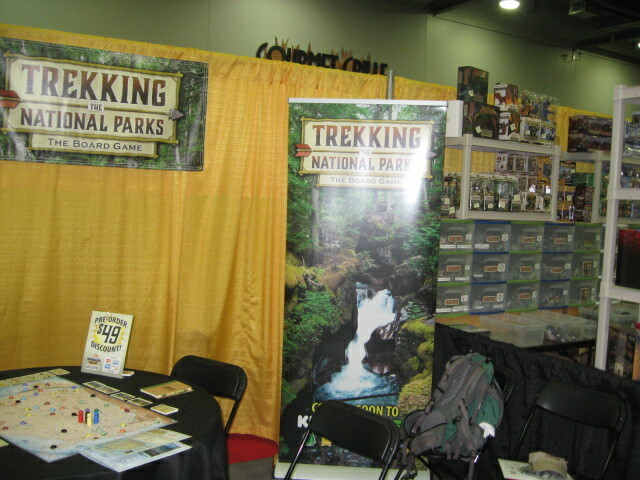 I’m not in the Exhibitor’s Hall now. 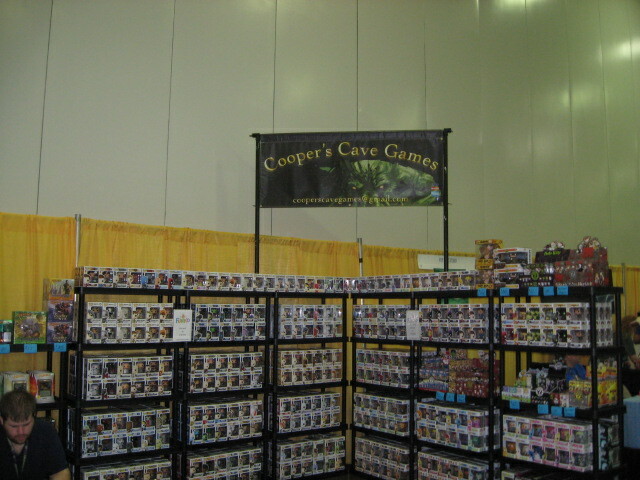 I’m off in open gaming where the mini-gamers have set up. 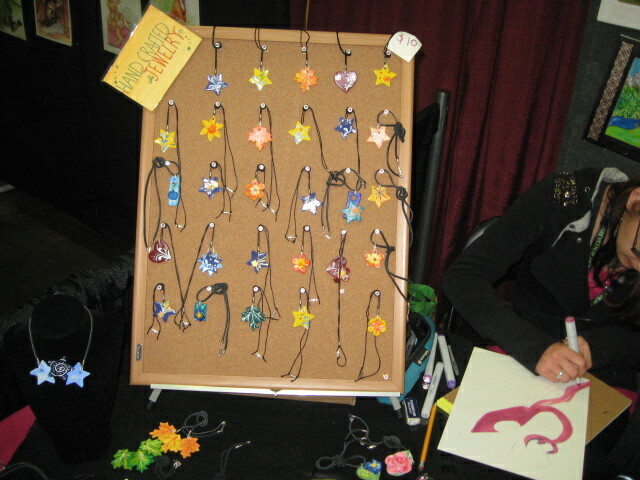 If I had a lady, I would buy her one of these gamer jewels. 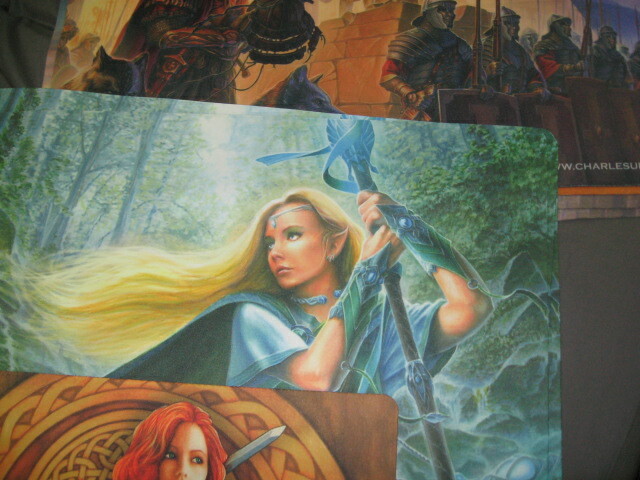 I do so love fantasy art featuring warrior women. Not sure I wanna be married to one tho in the modern world. 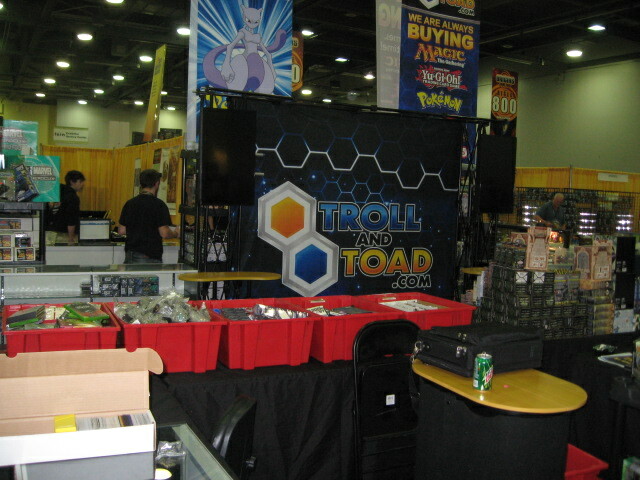 A good thing about the dealer halls these days are the many demos going on. Tired? Sit down and learn a new game. 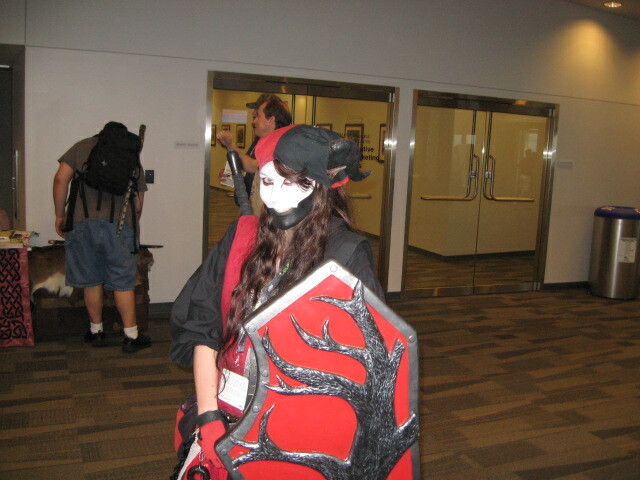 Speaking of warrior women, there weren’t very many hall costumes, but this woman had the best one of all. Awesome to look at, and a killer smile when I talked to her. I wanted her so much. 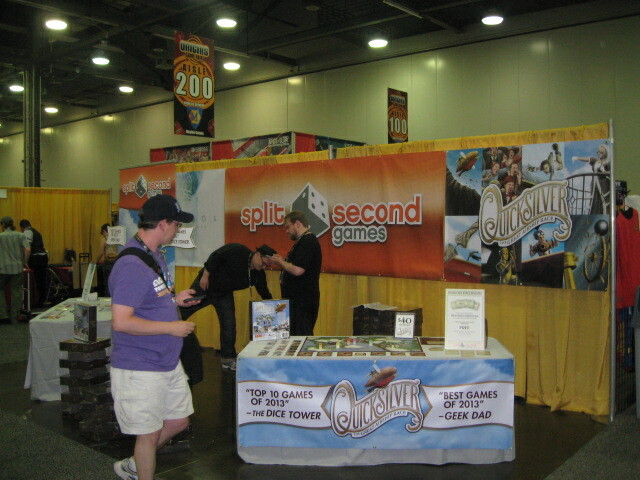 This is what the main concourse looked like after Origins had ended on Sunday afternoon. 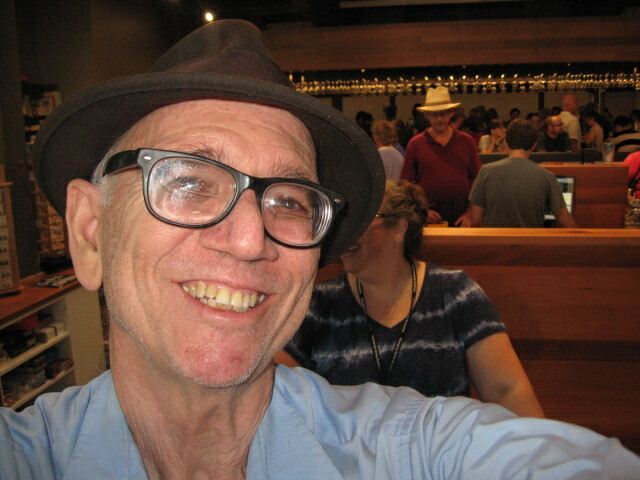 Finally, a selfie picture of me just to prove I was there. Crom! I look more like a gnome or a goblin than a troll these days. Maybe it will look better if I grow my beard back. 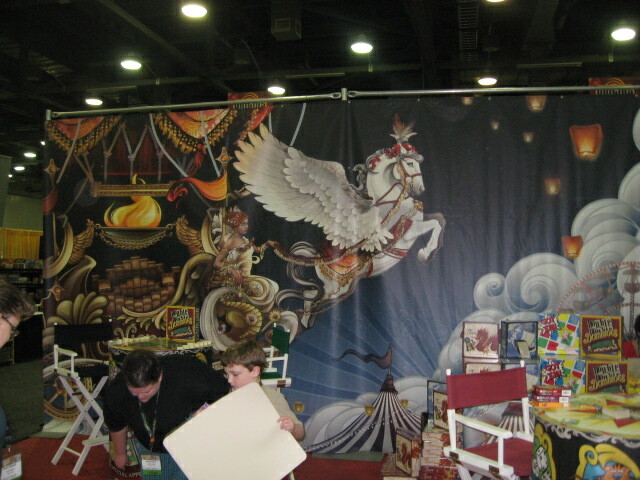 I started working on it for the whole week of Origins travel and show. 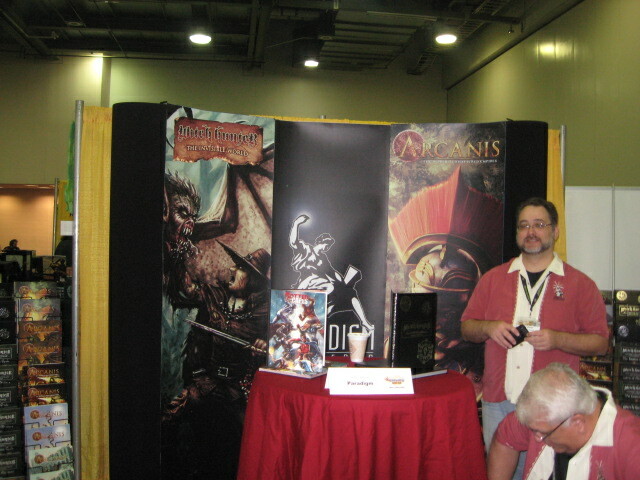 And that was my look at Origins 2014. 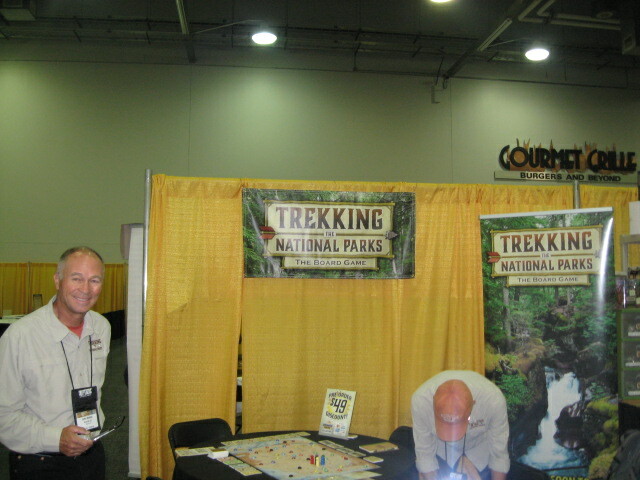 If you were there, and have a comment, please leave one. 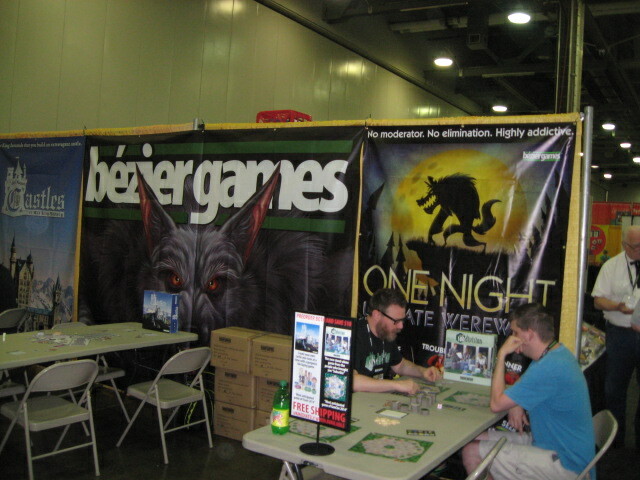 What did you like best and least about this year’s Origins? 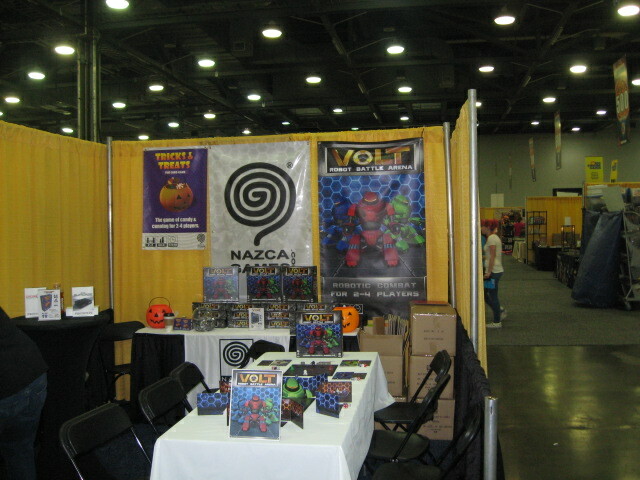 I wasn’t going to attend this Con, but at the last moment I got some motivation, and so I did make the scene on Friday and Saturday. Estimated attendance somewhere in the range of 100,000 people. That’s a great size for a media convention like this. Guarantees that the promoters will make enough money to put on a really good show. Attracts a lot of creative energy. 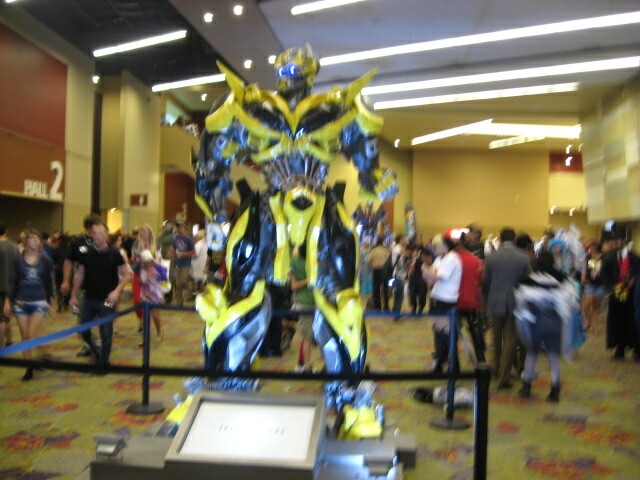 As usual, I went mostly to take photos of brilliant hall costumes, play games, and talk to my friends. All 3 goals were satified this weekend. I think I can get more than one blog out of it. Let’s start off with heroes and villains. 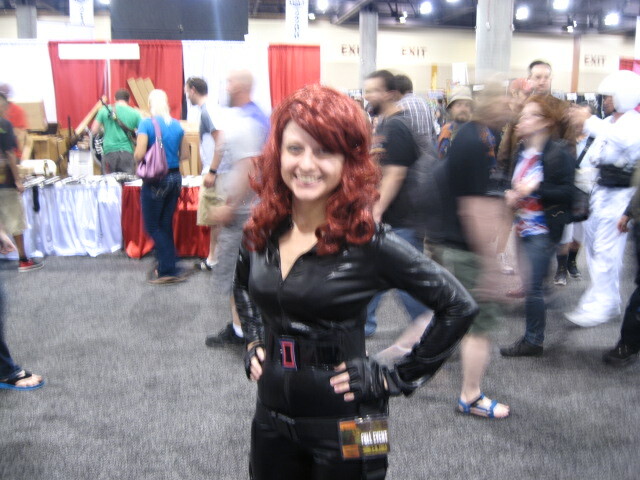 I had a hard time getting the Black Widow’s attention. Finally, her boyfriend poked her in the arm and said, “Natasha, this man wants you to kill him.” Killer smile, don’t you think? Batman looked suitably grim, but didn’t seem to have any crime to fight, despite the plethora of supervillains wandering around. I got him to pose for me, and that opened the floodgates. Poor guy got stuck posing with people for another 5 minutes before he could move on. He loved it. Poison Ivy came by Steve Crompton’s Carnal Comics booth and told us she could make something grow. This girl has a secret identity as a stripper at Christie’s Cabaret. She made me an offer I really hated to refuse. Poison Ivy was the most popular costume at the Con. Here she is again with a Joker wannabe. 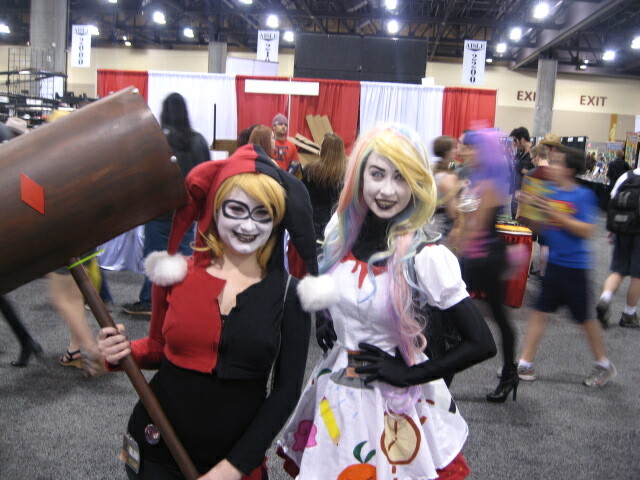 Harley Quinn and her friend gave me these dazzling smiles when I told her I’d love to get hammered with her. 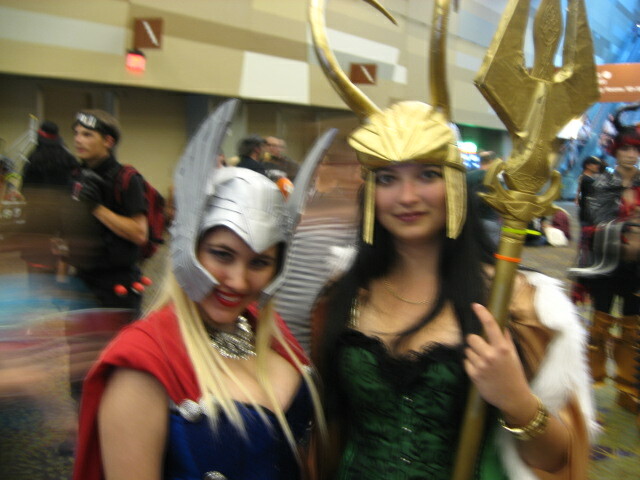 Thor and Loki, female variants. If it works for guys, it works for girls too. 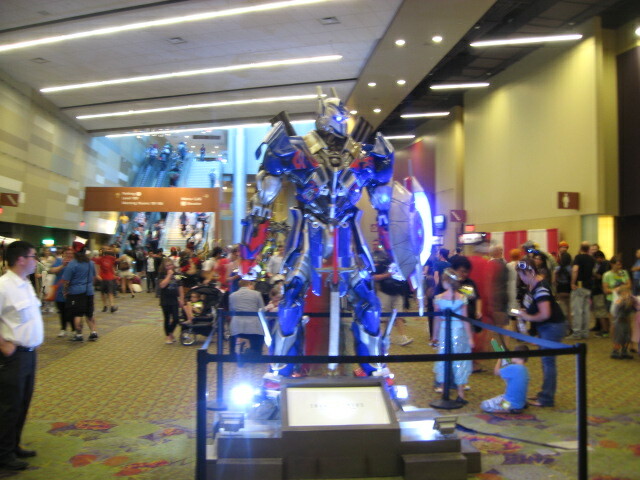 The Transformers were larger than life, and kept behind a fence. If I saw this guy walking down the street, I’d get out of his way, then follow him looking for photo ops. Not every larger than life character needs spandex. 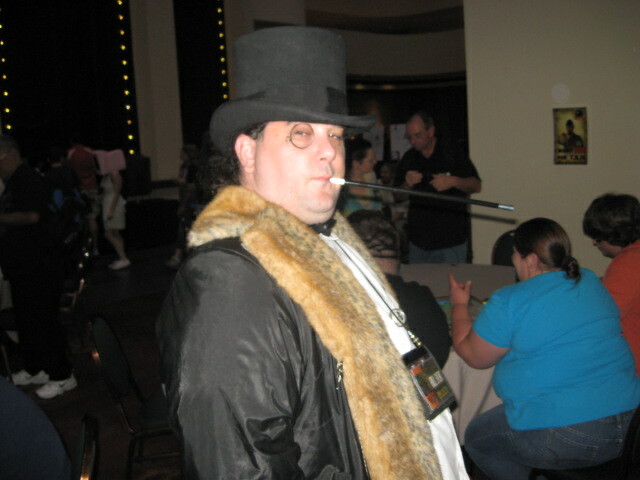 The Penguin makes do these days with simple opulence. The Joker was looking better than he has for years and his Harley Quinn seemed pretty happy about it too. 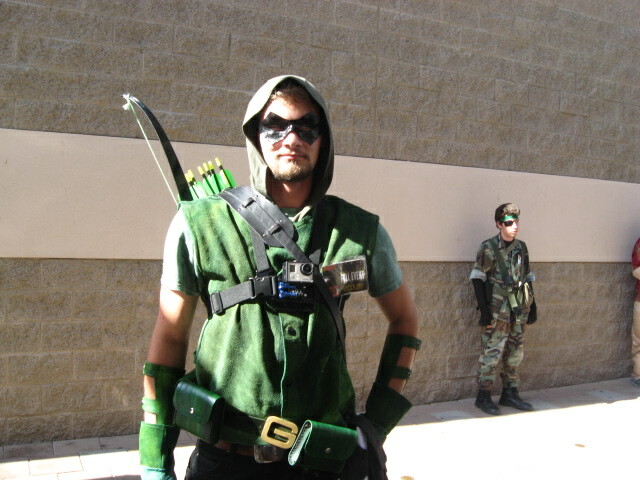 Green Arrow came rushing by just before I headed for the Troll Cave on Saturday afternoon. There were countless other supers at the convention, but I didn’t go with a plan. 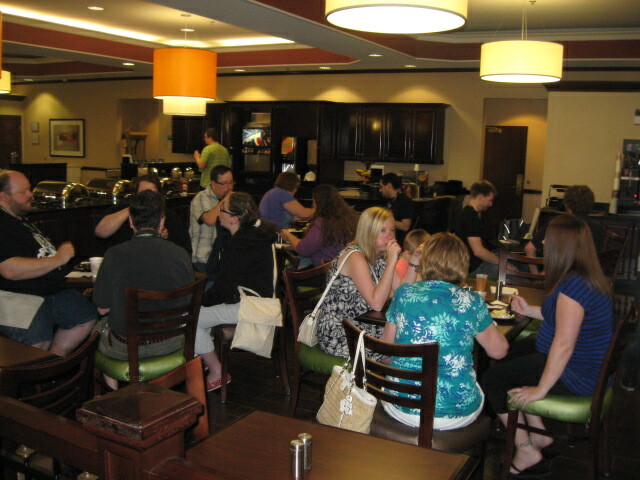 I simply took pix of those that came my way. Spider-Man was there in every conceivable variant of the spider suit. Deadpool must have cloned himself. He was everywhere. Poison Ivy sprouted almost everywhere I looked. 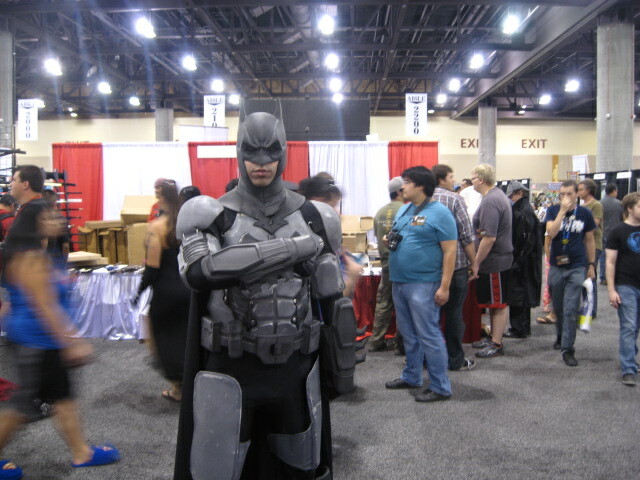 I saw Batman from several different alternate earths. Superman, however, could not be found. 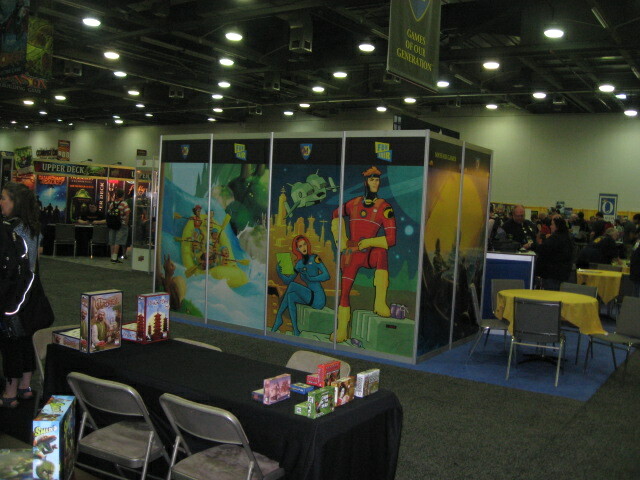 Actually Adam West (Batman), Burt Ward (Robin) and Julie Newmar (Catwoman) were big attractions at ComiCon, although I did not see them. 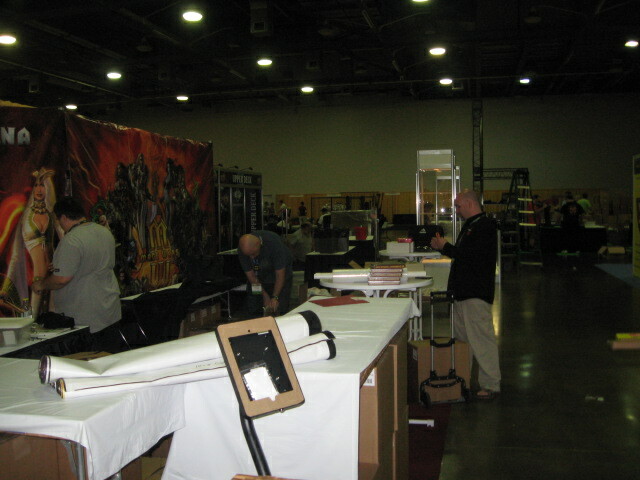 Stan Lee is supposed to be there today (I am writing this on Sunday, June 8). 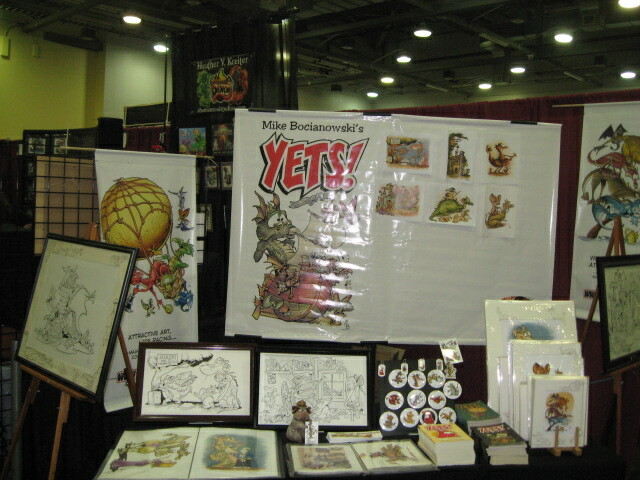 Comics, and the popular culture associated with comics have never been so popular. 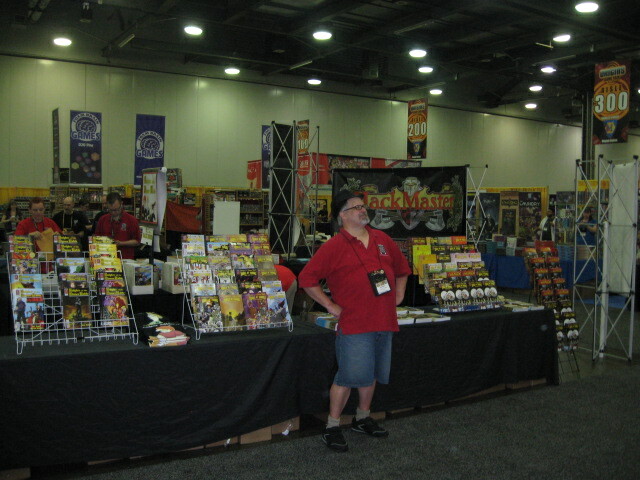 Comics conventions are gigantic parties, and people really seem to have a good time at them. I salute those dedicated cosplayers who make marvelous costumes to represent the heroes, villains, and favorite characters from comics, cartoons, anime, and video gaming. You guys and gals are indeed super in your own right, and I applaud you all. 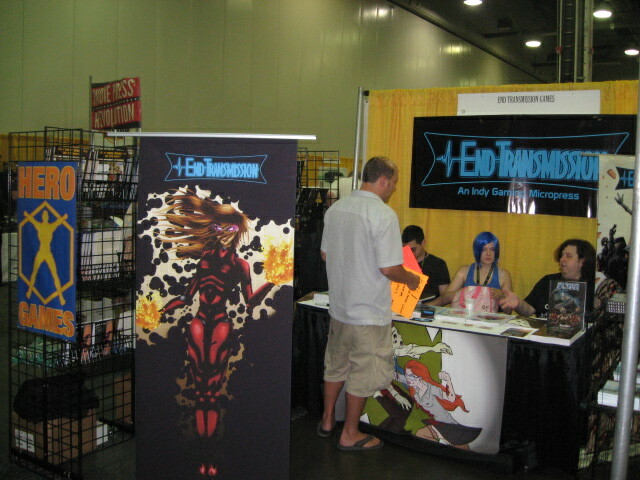 If you have been to a comics convention lately, why not leave a comment? 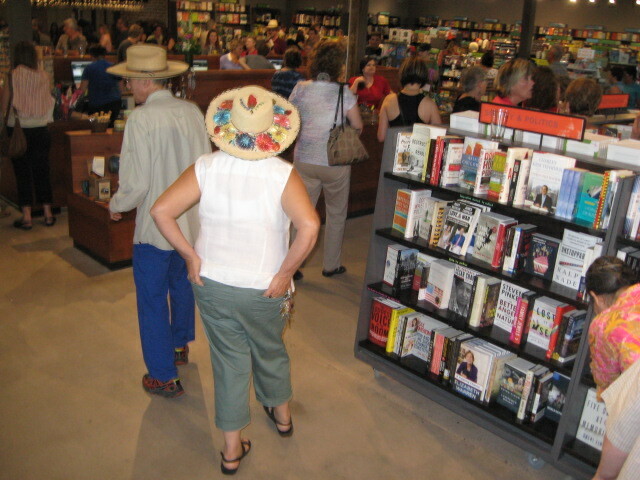 Friday night, May 30, at 5 p.m. the Changing Hands bookstore, a store that has served the Phoenix metropolitan area for 40 years, although it has always been in Tempe, opened a new store at 3rd Avenue and Camelback Road, in the central Phoenix corridor on the light rail line. This was the site of a famous old ritzy restaurant called Beefeaters, but that restaurant closed up a few years ago, leaving just some expensive real estate and the shell of a building behind. 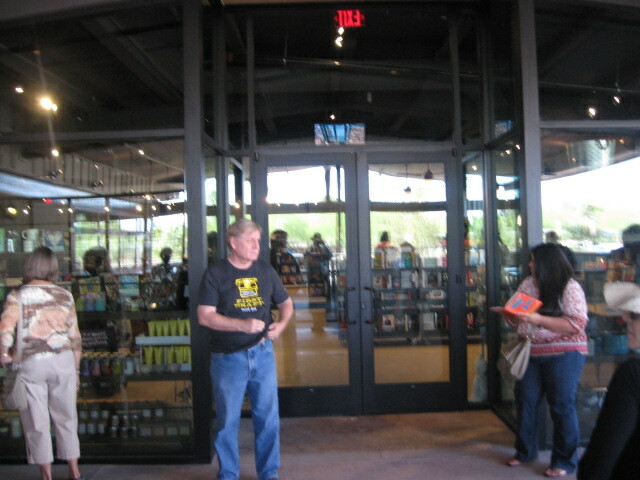 Changing hands is one of two great independent bookstores in the Phoenix area–the other one is the Poisoned Pen in Scottsdale. I’m an ex-librarian and an author (and a book accumulator). I love bookstores. I decided not to miss this gala event. I got there about 4:45 p.m. 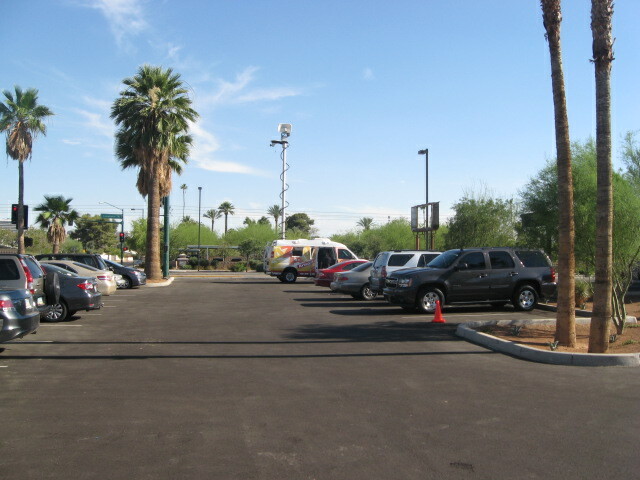 The parking lot was already full, and Channel 10 television sent a news van to cover the story. 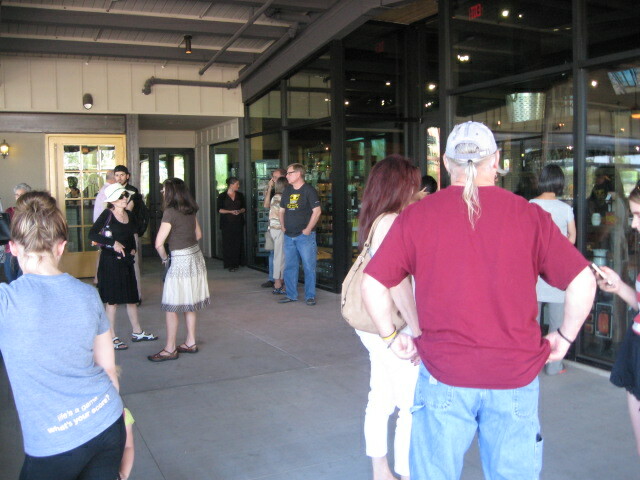 A pretty good crowd was already waiting for the doors to open. Many more would arrive in the next hour. 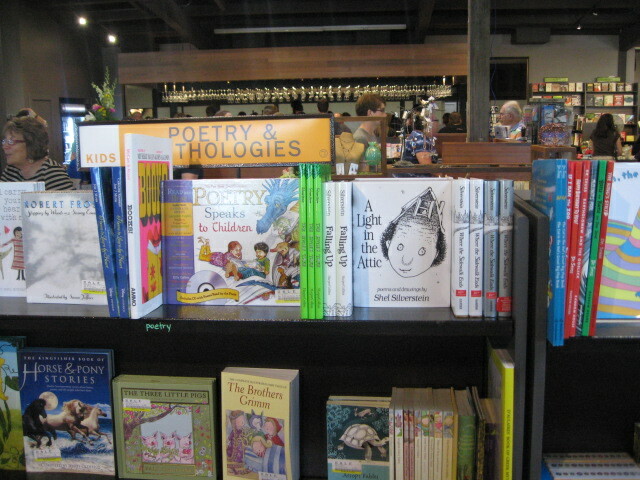 Looking at the front door of Changing Hands. 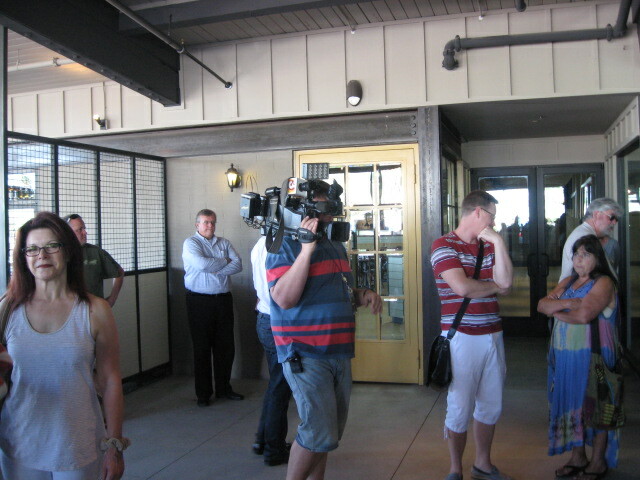 Cameraman from Channel 10 waits to get inside just like the rest of us. 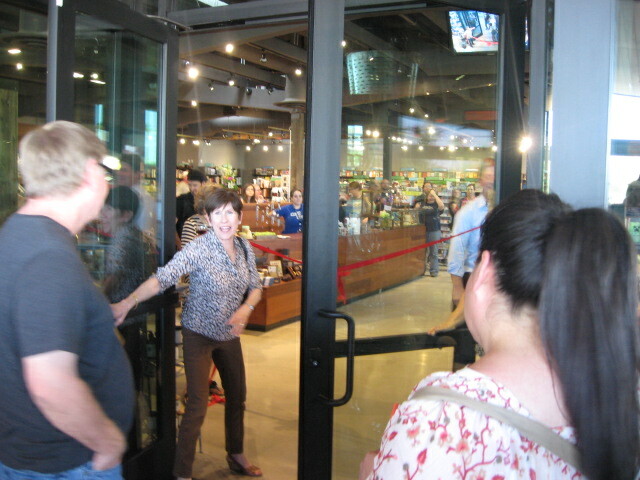 The owner tells us the doors will open soon at about 5:06 p.m. A red ribbon has been strung across the entrance and Phoenix Mayor Greg Stanton is ready to cut it and let people in. 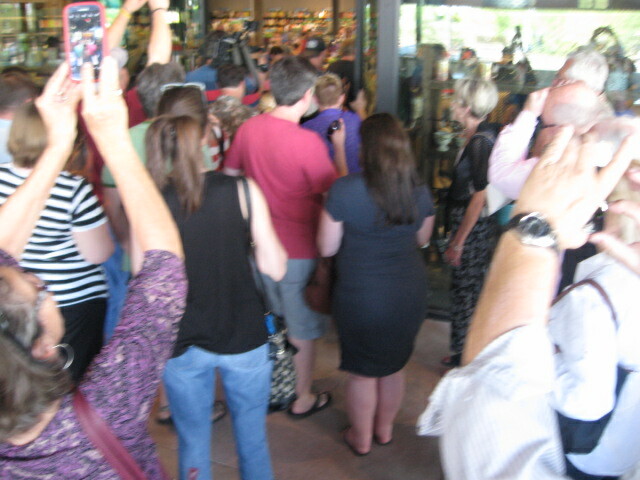 Mayor Stanton is in the center of this shot, facing camera, open face, fair complexion. I’m gonna give him props for caring about books! Good stuff, nothing radical, in the Children’s section. 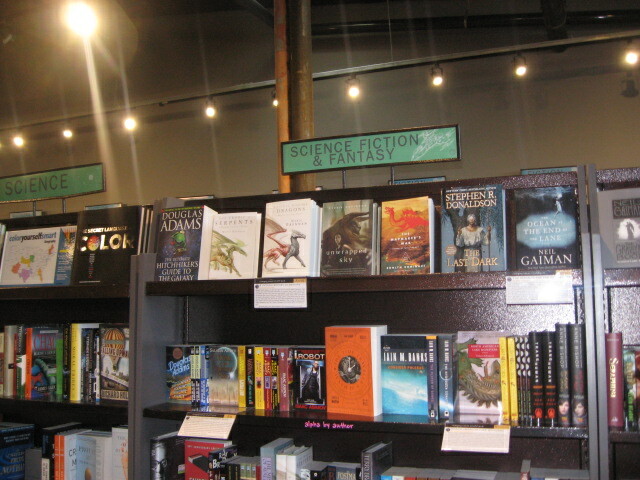 I also checked out the science fiction section. 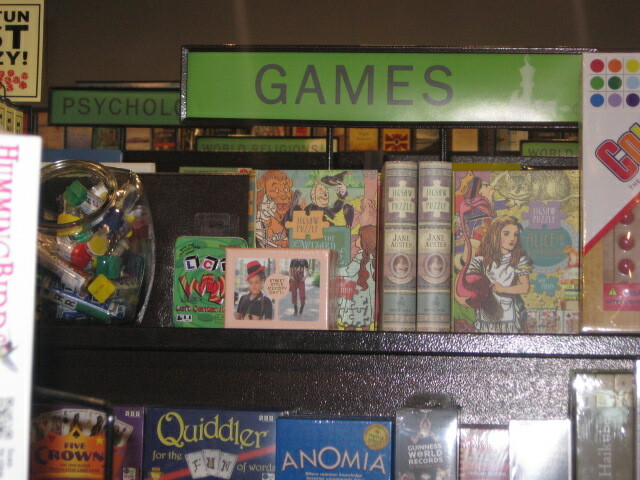 One of the things I wanted to see was what they had in their Games section–looks like word games are popular. 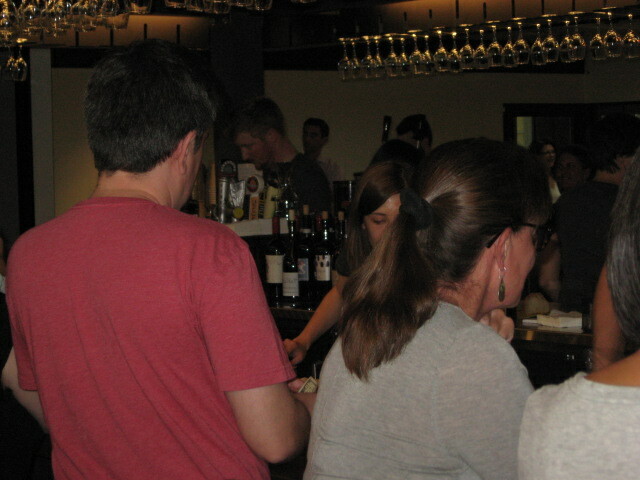 What really makes this bookstore stand out, is that it has its own bar, called First Draft. That’s a nice pun since a draft is a manuscript that hasn’t been published, and also a glass of beer that hasn’t been quaffed yet. Draft is one of those words that has a lot of meanings–I wonder how that came about–which makes it ideal for punning. 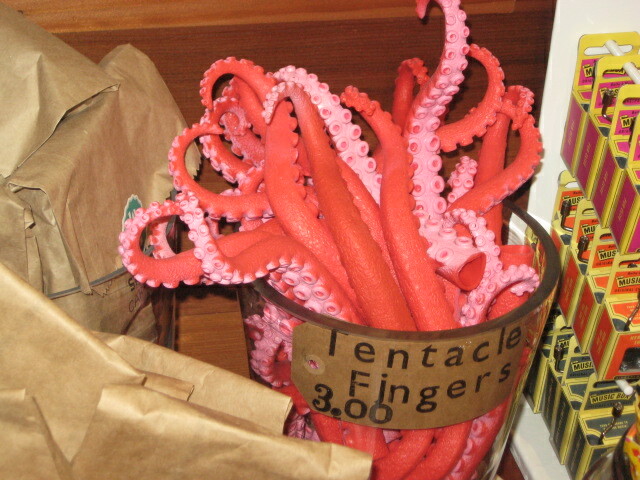 I found a bucket of tentacles. Just what everybody needs, right? 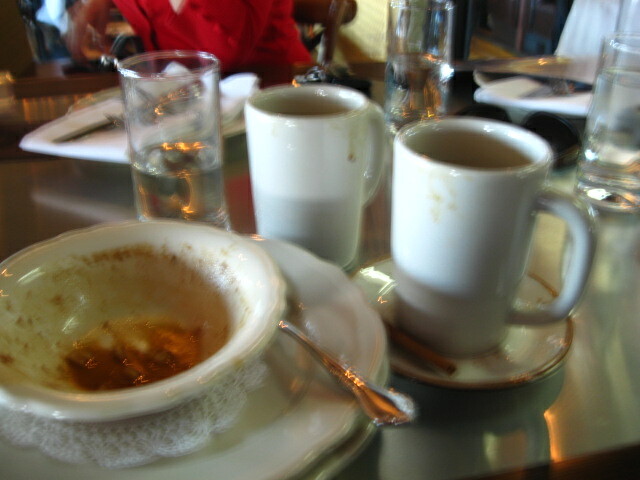 Bookstore coffee cups. I kinda like personalized cups like this and have quite a few, though I didn’t buy this one. 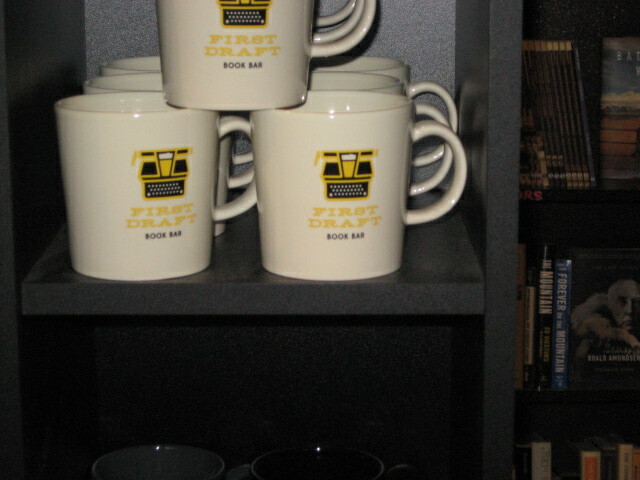 It’s a coffee cup, but First Draft is the bar–disconnect there. I found a book I decided to buy. This book will reappear in a future blog. 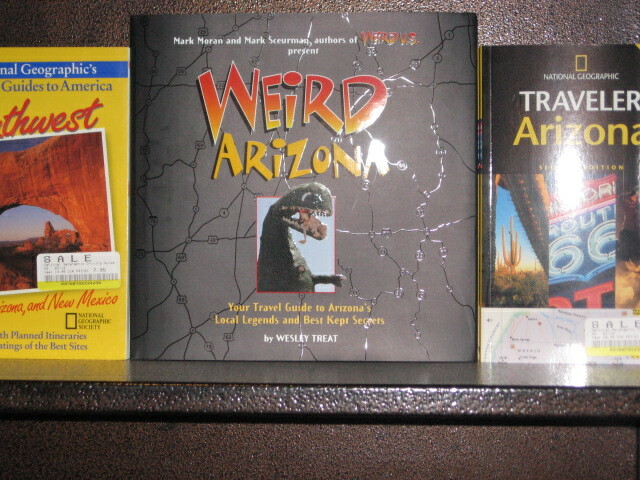 I have an idea how to get some mileage out of Weird Arizona. 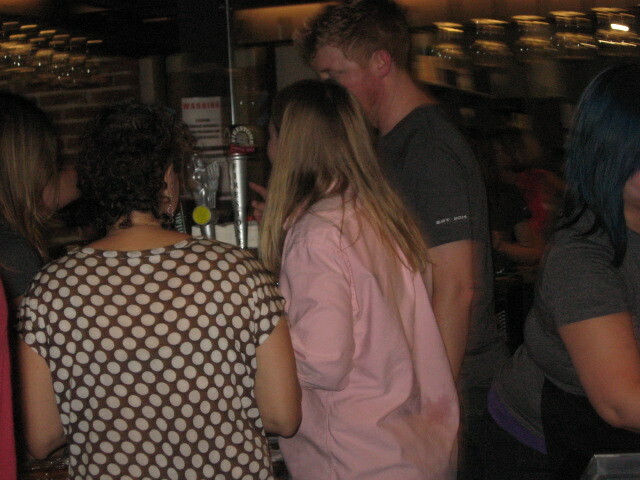 People really flocked to the bar. Every seat was taken. 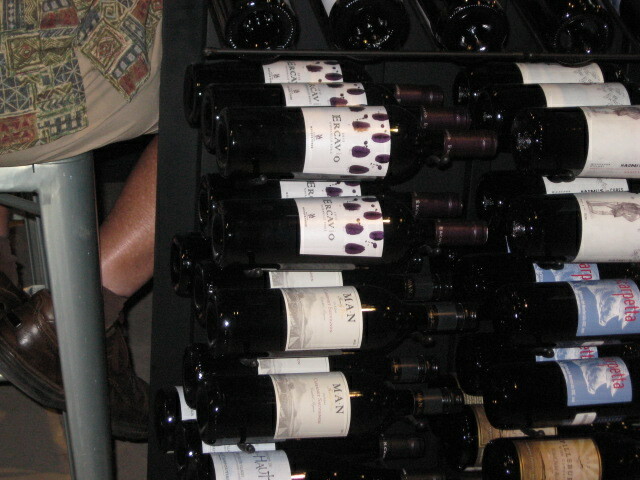 Here’s a rack full of bottles of wine. Why buy one glass when you buy the bottle? 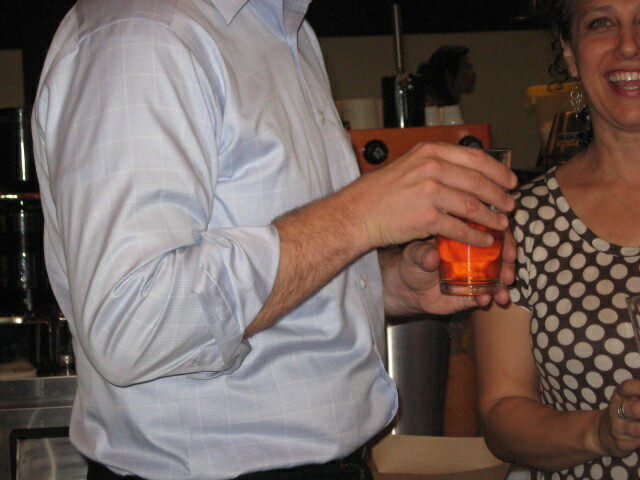 This is a terrible shot of Mayor Stanton enjoying a glass of beer. I thought it might make blackmail material, but I cut off his head. Bwa ha ha ha! How do we feel about politicians? Off with their heads! 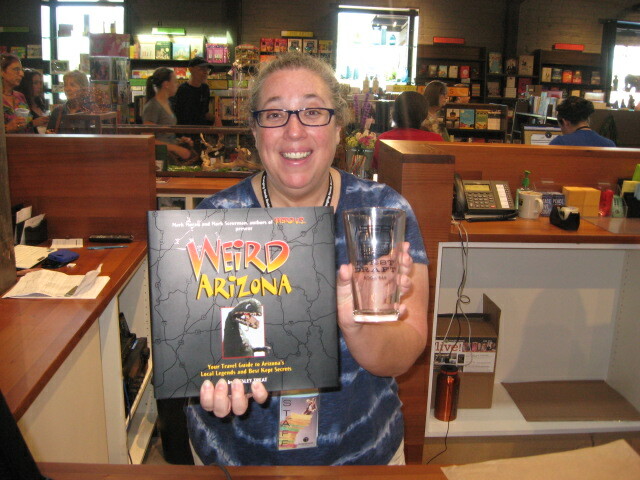 Here are my purchases for the night–a book and a beer glass from First Draft. I think my clerk’s name is Abby. 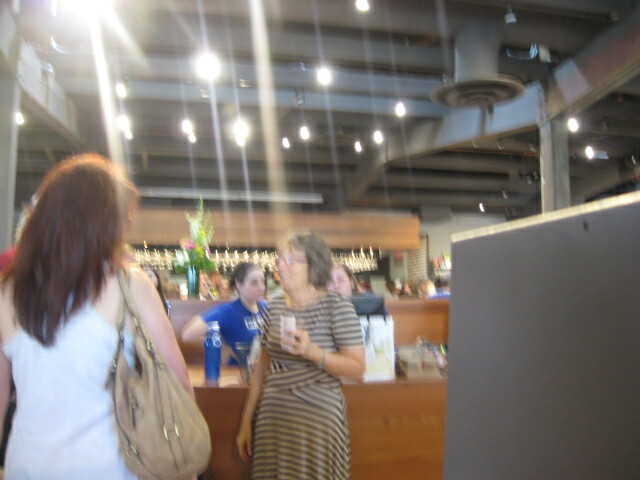 She was very friendly and happy to be there. 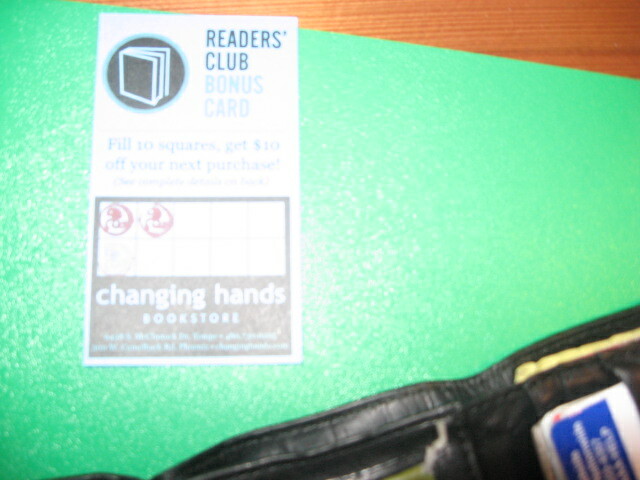 Abby signed me up for the Changing Hands Reader Club. Every time I buy something I’ll get a stamp on the card. Eventually, it will get me a disount or something free. I took my purchases out and stashed them in my car. I didn’t want to carry them around. 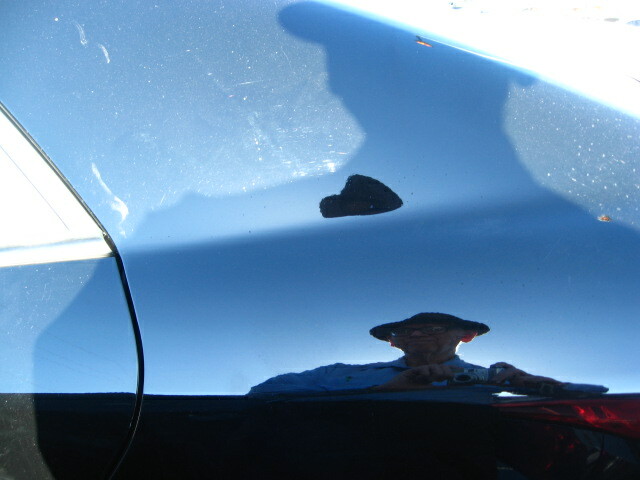 I have grown rather fond of taking pix of myself as a reflection in my car. You can see I was there, but you can’t really see me. 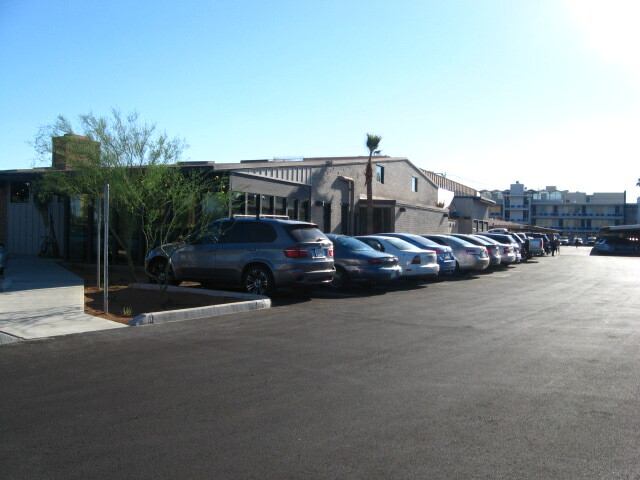 5:30 p.m. the parking lot is really crowded now. 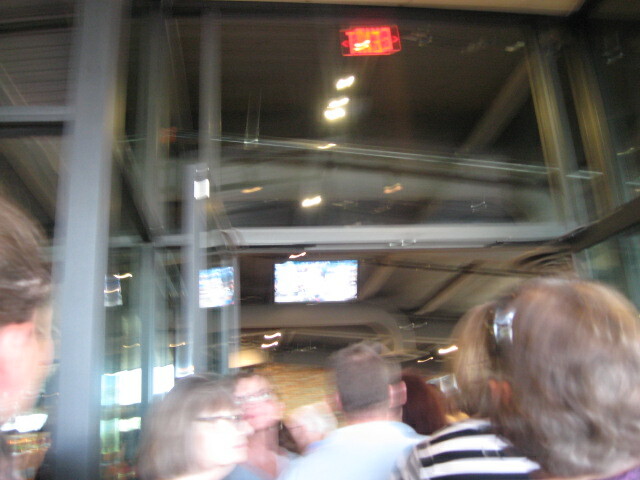 People trying to get in were clearly disappointed when I didn’t leave yet. 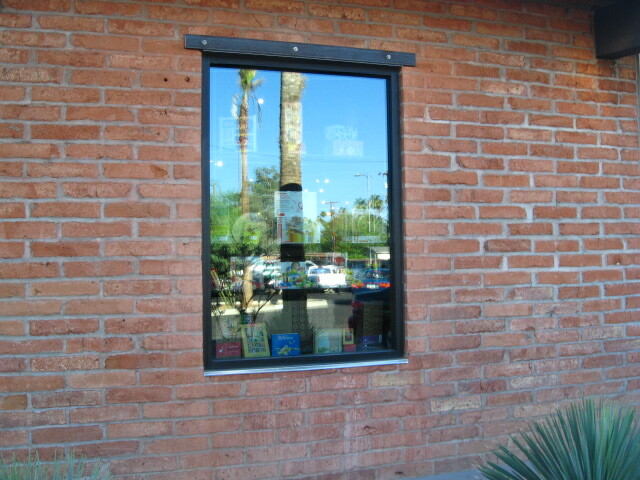 Bookstore window from the outside. I was headed back for seconds, but . . . I got distracted and went into the restaurant that was also having its opening night. These ladies greeted me at the door and explained things. 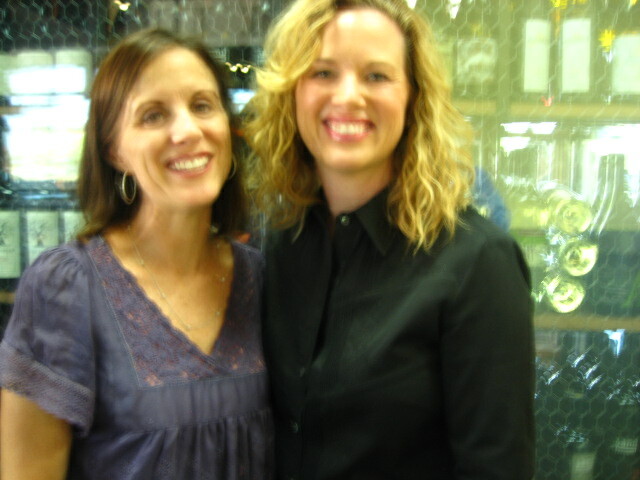 The blonde told me she was a vampire–she has the teeth, but I don’t think she’s a blood drinker. 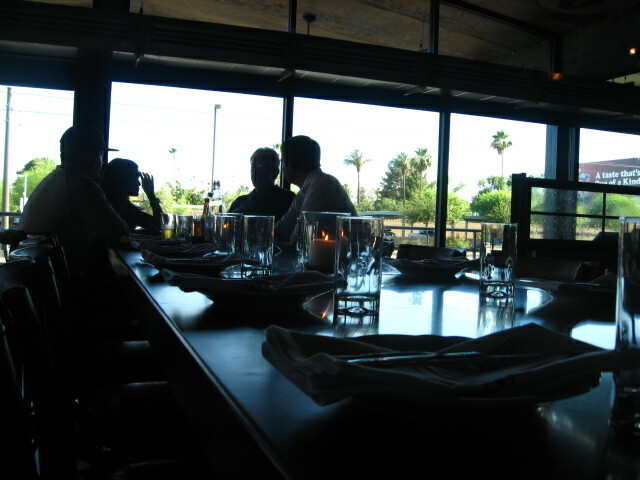 I wound up sitting at the community table–a place for people without reservations. 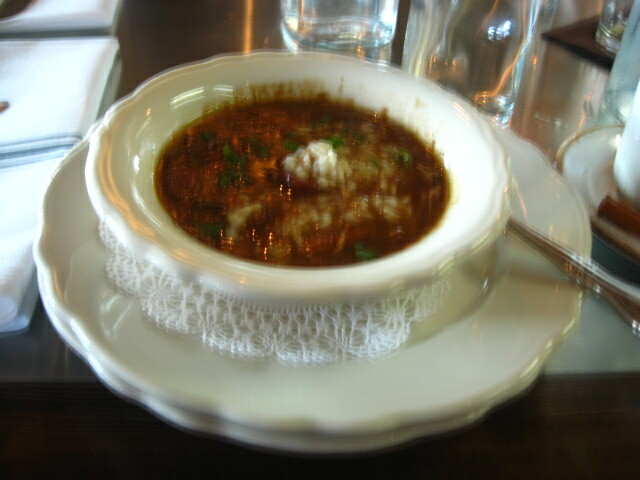 and ate chicken gumbo. It’s very spicy, but very good. 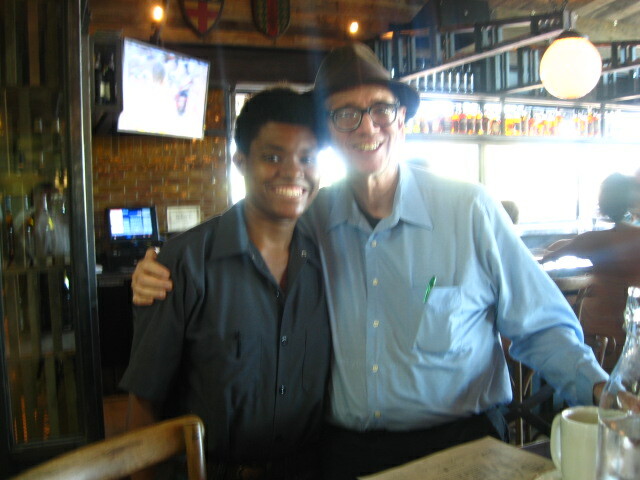 and I got my picture taken there at the Southern Rail restaurant with my server. What a pretty girl! Many years ago this whole building was a famous Phoenix restaurant called Beefeaters. 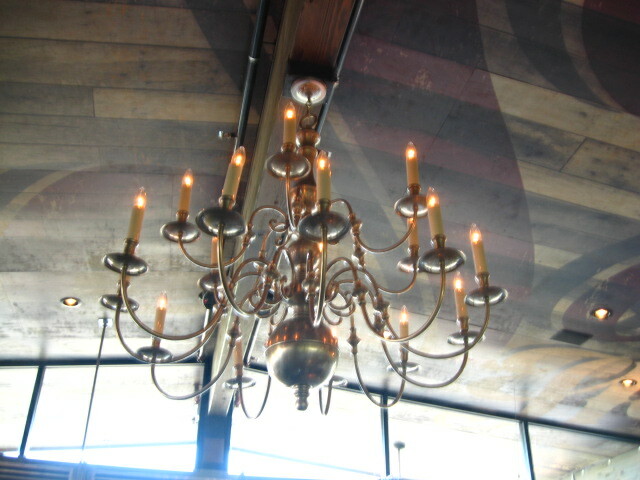 One of the waiters explained that the chandeliers and the walls were just about all that remained from the Beefeater establishment. I finished off the gumbo. 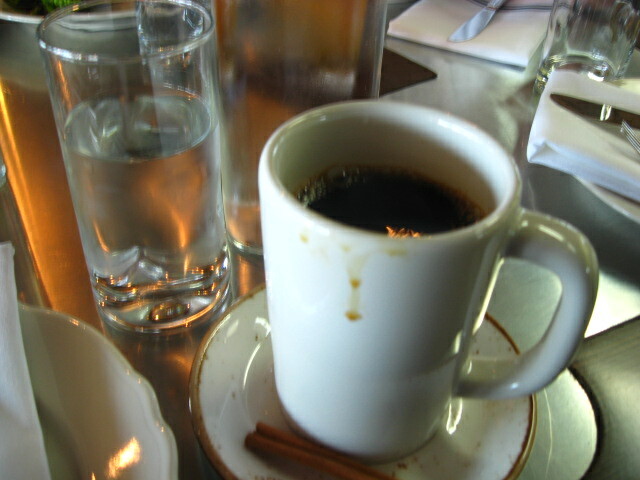 I drank a second cup of very bitter chicory coffee–at least it’s strong, you can taste it, and got the bill. When I tried to use my credit card to pay for it, the manager came by and said they couldn’t take credit yet, and comped me my meal. Nice! 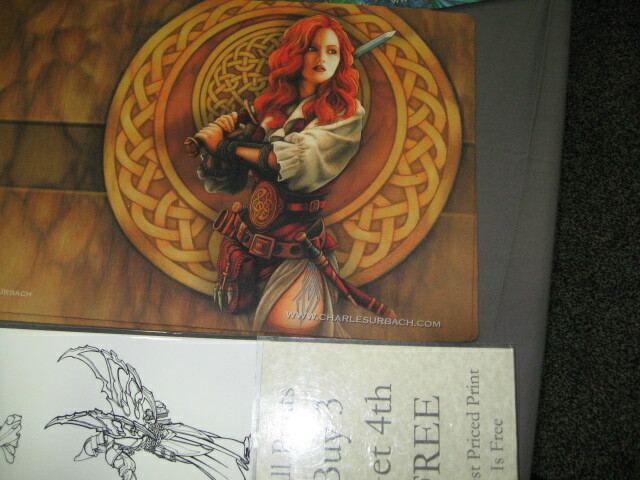 After the meal, I went back and made one last pass through the bookstore. I took a selfie . . .
and went on my way back home. The whole experience took just under 2 hours. 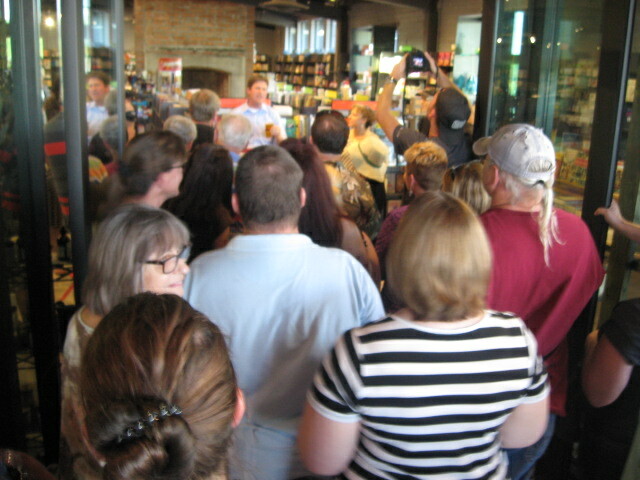 I’m glad I went to the opening of the Changing Hands bookstore. I had a good time. 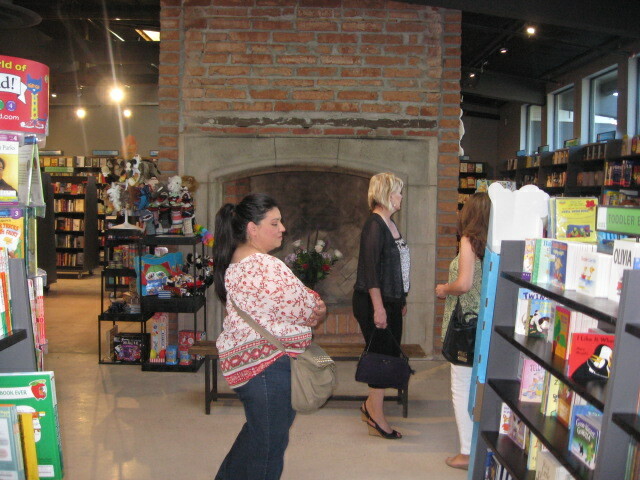 It’s a great independent bookstore, and the kind of place I can show off to visitors from other cities. 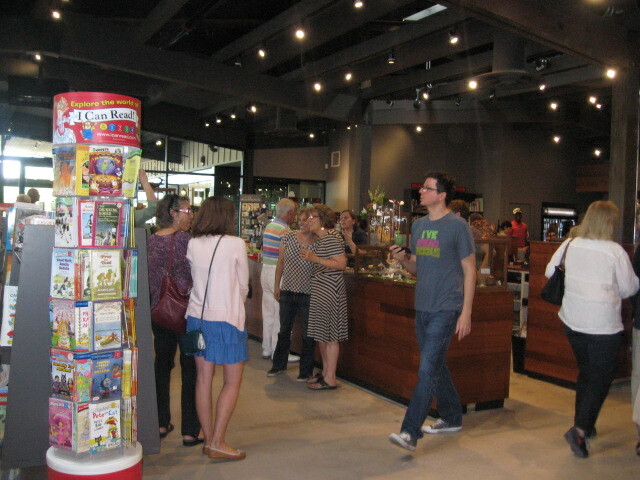 It has more than books, and would be a good place to do Christmas and birthday shopping. 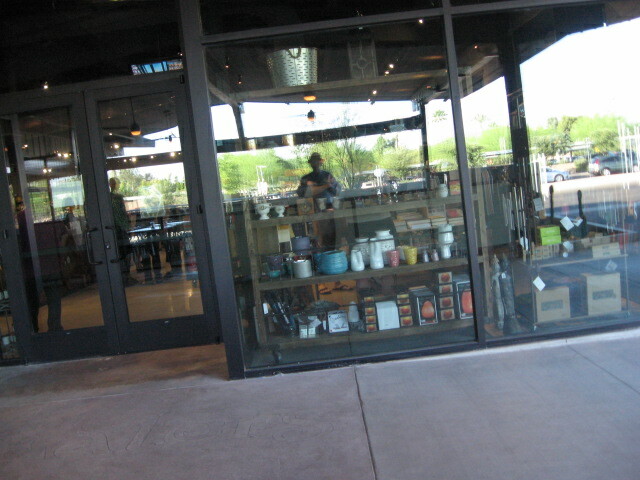 I’m hoping that Changing Hands will have a long successful run here in Phoenix. If you’ve ever gone to a bookstore opening, or even if you just like to hang out in such places, why not leave a comment?